Dr. Eugenie Brunner examines the increase in men requesting non-surgical cosmetic enhancement and touches on the treatment modifications required for male anatomy. 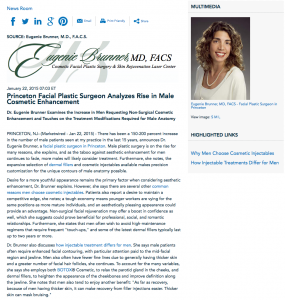 Princeton, NJ—There has been a 150-200 percent increase in the number of male patients seen at my practice in the last 15 years, announces Dr. Eugenie Brunner, a facial plastic surgeon in Princeton. Male plastic surgery is on the rise for many reasons, she explains, and as the taboo against aesthetic enhancement for men continues to fade, more males will likely consider treatment. Furthermore, she notes, the expansive selection of dermal fillers and cosmetic injectables available makes precision customization for the unique contours of male anatomy possible. Desire for a more youthful appearance remains the primary factor when considering aesthetic enhancement, Dr. Brunner explains. However, she says there are several other common reasons men choose cosmetic injectables. Patients also report a desire to maintain a competitive edge, she notes; a tough economy means younger workers are vying for the same positions as more mature individuals, and an aesthetically pleasing appearance could provide an advantage. Non-surgical facial rejuvenation may offer a boost in confidence as well, which she suggests could prove beneficial for professional, social, and romantic relationships. Furthermore, she states that men often wish to avoid high-maintenance regimens that require frequent “touch-ups,” and some of the latest dermal fillers typically last up to two years or more. Ultimately, Dr. Brunner believes the trend toward increasing male aesthetic enhancement will continue, and she encourages men considering cosmetic injectables to research a board-certified facial plastic surgeon to perform the treatment. A qualified injector, she emphasizes, will customize the experience to suit not only the expressed goals of the patient but also their unique anatomical needs. Certified by the American Board of Facial Plastic and Reconstructive Surgery and the American Board of Otolaryngology, Dr. Brunner is a facial plastic surgeon who has been practicing in the Princeton area since 1997. She earned her medical degree from the Robert Wood Johnson Medical School—The University of Medicine and Dentistry of New Jersey. She is also a Fellow of the American College of Surgeons, as well as an active member of the American Academy of Cosmetic Surgery, the American Academy of Facial Plastic and Reconstructive Surgery, and the American Board of Otolaryngology, Head and Neck Surgery. Dr. Brunner is available for interview upon request.